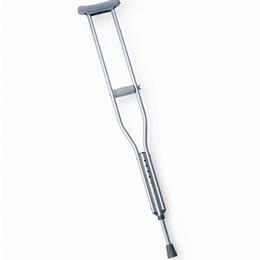 Latex-free Aluminium Adult Crutch is designed to give extra support to those who need balance while walking. All the parts are made of internal bushings which provides silent usage. Black components of the crutch hide any unexpected scratches. Can hold to the weight of 300lb. Available for in Youth, Child, Adult and Tall Adult sizes.